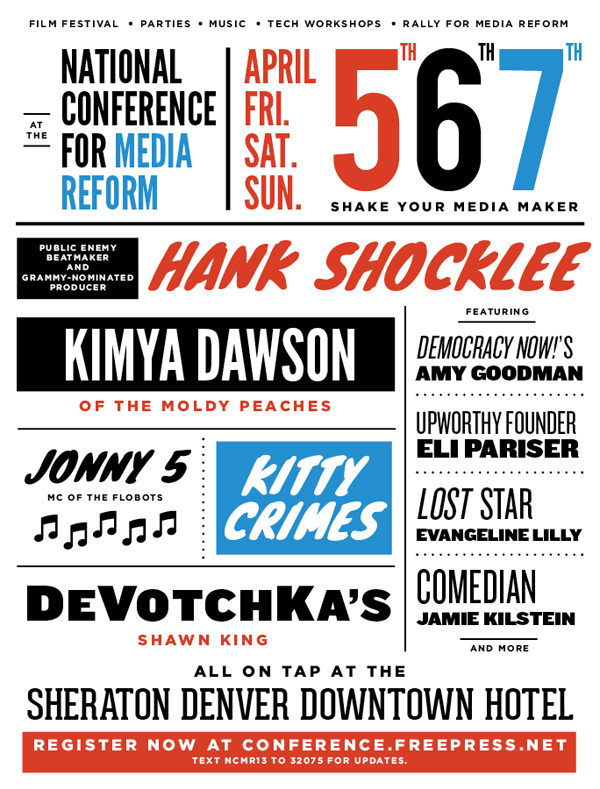 On April 5, the National Conference for Media Reform — the nation’s biggest conference devoted to media, technology and democracy – will kick off in Denver. Thousands of activists, media makers, journalists, policymakers, technologists and artists will travel to the Mile High City for three days of inspiring speeches, performances — and 60 sessions featuring more than 350 presenters. Filed Under: News Tagged With: activists, Ai Weiwei, Amy Goodman, art, artist, book, Brer Rabbit, change, creative, creators, culture, democracy, denver, DeVotchKa, Evangeline Lilly, event, Film, Flobots, free press, future, Hank Shocklee, Hari Kondabolu, innovation, Jamie Kilstein, Janine Brito, John Nichols, Jonny 5, Juan Gonzalez, Kitty Crimes, McNichols Building, media, Melissa Fitzgerald, Michael B. Hancock, Michael Copps, music, poetry, policy, Robert W. McChesney, Shawn King, shift, social justice, society, Staceyann Chin, sundance, Susan Crawford, technology, thinking, u.s.